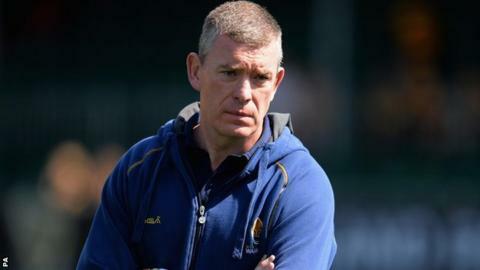 Worcester director of rugby Dean Ryan says that he is "honoured" to have been asked to coach the Barbarians against England at Twickenham on 1 June. England are likely to name a weakened side - just a week before Test matches on successive weekends in New Zealand. But, after a forgettable season with relegated Worcester, the former England forward has received a big fillip. "I'm incredibly honoured that they even thought to pick up the phone and ask me," Ryan told BBC Sport. "The Barbarians are a special entity and have been so for me right back to when I was 18 or 19, when I was a young player at Saracens, and had the thrill of someone picking me, long before I'd played international rugby. "It's appreciated. I've been coaching now for 16 or 17 years and I like to think I've conducted myself well and been fairly successful, which is still the intention here at Worcester. "But, at the end of the season, it is nice to get the chance to be able to step outside and do something like this and I'm very grateful for the support of the club in letting me do so." The famous invitational side have already named 14 of the team who will play - half of whom are New Zealanders, former All Blacks Ali Williams, John Afoa, Carl Hayman, Hosea Gear, Sitiveni Sivivatu, Rene Ranger and Jimmy Cowan. England's Steffon Armitage has also been picked, along with three Australians, Matt Giteau, James O'Connor and Drew Mitchell, and three Frenchmen, Julien Bonnaire, Francois Trinh-Duc and Aurelien Rougerie. But the tradition, as Ryan found out himself a quarter of a century ago, is to pick one uncapped player in the Barbarians team. Worcester complete their Premiership season on Saturday against Ryan's old club Gloucester, looking to finish on a high note by claiming only their second win.